Dynamax Medicine Ball 2 kg (35,5 cm) 580402 is a great way to exercise any area of your body including the core, upper and lower extremities.Improves core strength, joint integrity, coordination, range of motion, and flexibility.Can be used to train explosive power and improve coordination. Dynamax Medicine Ball 3 kg (35,5 cm) 580403 is a great way to exercise any area of your body including the core, upper and lower extremities.Improves core strength, joint integrity, coordination, range of motion, and flexibility.Can be used to train explosive power and improve coordination. Dynamax Medicine Ball 4 kg (35,5 cm) 580404 is a great way to exercise any area of your body including the core, upper and lower extremities.Improves core strength, joint integrity, coordination, range of motion, and flexibility.Can be used to train explosive power and improve coordination. Dynamax Medicine Ball 5 kg (35,5 cm) 580405 is a great way to exercise any area of your body including the core, upper and lower extremities.Improves core strength, joint integrity, coordination, range of motion, and flexibility.Can be used to train explosive power and improve coordination. Dynamax Medicine Ball 6 kg (35,5 cm) 580406 is a great way to exercise any area of your body including the core, upper and lower extremities.Improves core strength, joint integrity, coordination, range of motion, and flexibility.Can be used to train explosive power and improve coordination. Dynamax Medicine Ball 7 kg (35,5 cm) 580407 is a great way to exercise any area of your body including the core, upper and lower extremities.Improves core strength, joint integrity, coordination, range of motion, and flexibility.Can be used to train explosive power and improve coordination. Dynamax Medicine Ball 8 kg (35,5 cm) 580408 is a great way to exercise any area of your body including the core, upper and lower extremities.Improves core strength, joint integrity, coordination, range of motion, and flexibility.Can be used to train explosive power and improve coordination. Dynamax Medicine Ball 9 kg (35,5 cm) 580409 is a great way to exercise any area of your body including the core, upper and lower extremities.Improves core strength, joint integrity, coordination, range of motion, and flexibility.Can be used to train explosive power and improve coordination. Dynamax Medicine Ball 10 kg (35,5 cm) 580410 is a great way to exercise any area of your body including the core, upper and lower extremities.Improves core strength, joint integrity, coordination, range of motion, and flexibility.Can be used to train explosive power and improve coordination. 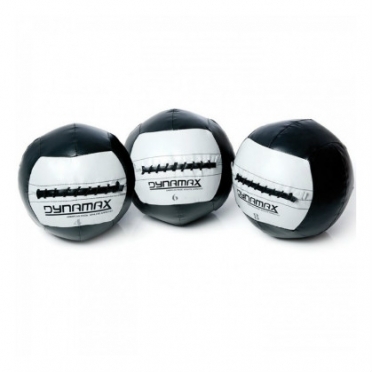 The Dynamax Medicine Ball mini 1 kg (25,4 cm) 580511 has the same high quality as the regular Dynamax medicine ball, but with a diameter of 25,44 cm.Improves core strength, joint integrity, coordination, range of motion, and flexibility.Can be used to train explosive power and improve coordination. Dynamax Medicine Ball training DVD 588010, this DVD provides a complete training manual with instructions. The Dynamax Medicine Ball mini 1,5 kg (25,4 cm) 580513 has the same high quality as the regular Dynamax medicine ball, but with a diameter of 25,44 cm.Improves core strength, joint integrity, coordination, range of motion, and flexibility.Can be used to train explosive power and improve coordination. 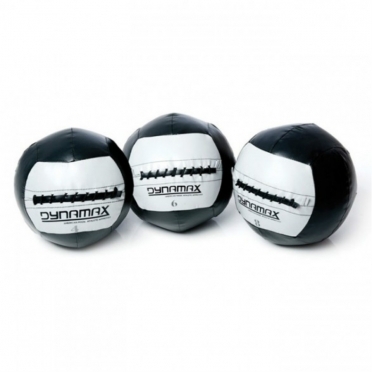 The Dynamax Medicine Ball mini 2 kg (25,4 cm) 580514 has the same high quality as the regular Dynamax medicine ball, but with a diameter of 25,44 cm.Improves core strength, joint integrity, coordination, range of motion, and flexibility.Can be used to train explosive power and improve coordination. The Dynamax Medicine Ball mini 2,5 kg (25,4 cm) 580515 has the same high quality as the regular Dynamax medicine ball, but with a diameter of 25,44 cm.Improves core strength, joint integrity, coordination, range of motion, and flexibility.Can be used to train explosive power and improve coordination. 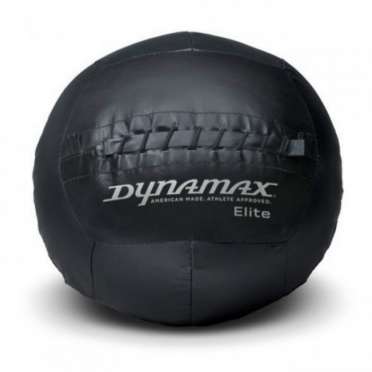 The Dynamax Medicine Ball mini 3 kg (25,4 cm) 580516 has the same high quality as the regular Dynamax medicine ball, but with a diameter of 25,44 cm.Improves core strength, joint integrity, coordination, range of motion, and flexibility.Can be used to train explosive power and improve coordination. Dynamax Medicine Ball elite 2 kg (35,5 cm) 580602, the Elite Dynamax balls are very durable/stronger than normal Dynamax Medicine Balls and are available in weights ranging from 2 kg - 12 kg.Improves core strength, joint integrity, coordination, range of motion, and flexibility.Can be used to train explosive power and improve coordination. Dynamax Medicine Ball elite 3 kg (35,5 cm) 580603, the Elite Dynamax balls are very durable/stronger than normal Dynamax Medicine Balls and are available in weights ranging from 2 kg - 12 kg.Improves core strength, joint integrity, coordination, range of motion, and flexibility.Can be used to train explosive power and improve coordination. Dynamax Medicine Ball elite 4 kg (35,5 cm) 580604, the Elite Dynamax balls are very durable/stronger than normal Dynamax Medicine Balls and are available in weights ranging from 2 kg - 12 kg.Improves core strength, joint integrity, coordination, range of motion, and flexibility.Can be used to train explosive power and improve coordination. Dynamax Medicine Ball elite 5 kg (35,5 cm) 580605, the Elite Dynamax balls are very durable/stronger than normal Dynamax Medicine Balls and are available in weights ranging from 2 kg - 12 kg.Improves core strength, joint integrity, coordination, range of motion, and flexibility.Can be used to train explosive power and improve coordination. Dynamax Medicine Ball elite 6 kg (35,5 cm) 580606, the Elite Dynamax balls are very durable/stronger than normal Dynamax Medicine Balls and are available in weights ranging from 2 kg - 12 kg.Improves core strength, joint integrity, coordination, range of motion, and flexibility.Can be used to train explosive power and improve coordination.